If you’re a Brocade vRouter customer, you are probably aware that the product is in its death spiral. Brocade has announced that vRouter will be end of sale and end of support shortly, if not already. Brocade vRouter 5400 has been end of support since August 20, 2017. Brocade vRouter 5600 will be end of support on October 5, 2017. A click through to Brocade’s Network Functions Virtualization page results in a 404. This leaves vRouter customers in a quandary, as the vRouter platform will not be moving forward. That’s too bad, as most of Brocade’s portfolio has found a home since Broadcom began selling off the bits it wasn’t interested in. 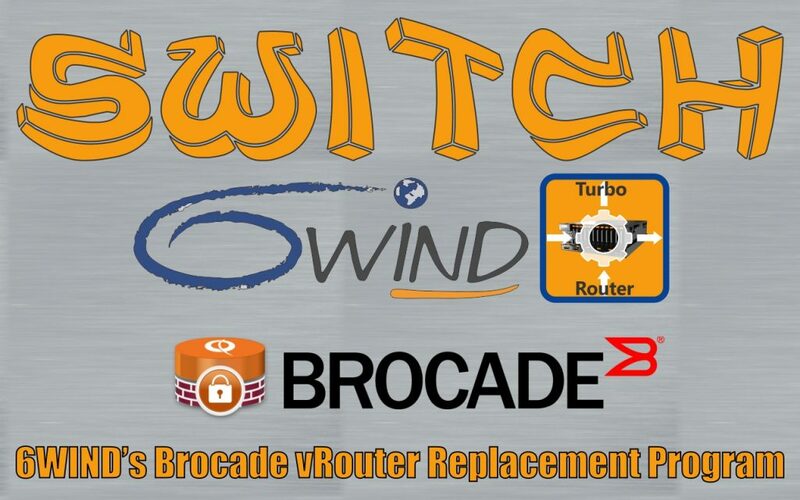 6WIND has announced a replacement program for Brocade vRouter customers. If you’re unfamiliar with 6WIND, they have been a Packet Pushers sponsor. You can hear a technical discussion of their software routers and related products on Priority Queue episode 63. To replace Brocade vRouter, 6WIND is positioning their Turbo Router product. 6WIND cites Turbo Router performance as 12 million packets per second per core and up to 1 million routes. A variety of standard NICs are supported with speeds of 1/10/40/100GbE. The forwarding architecture is based on DPDK, meaning that the traffic runs in the fast path outside of the Linux kernel, avoiding potential Linux kernel processing bottlenecks. Turbo Router capabilities are listed in the official data sheet, but include IPv4 and IPv6 support, NAT, VRFs, MP-BGP, OSPF, RIP, 802.1q, VRRP, BFD, LACP, QoS, packet filtering, stateful filtering, plus GRE and VXLAN. There’s quite a bit more if you explore the data sheet, but the features listed here are enough to demonstrate the usefulness of Turbo Router for a variety of environments. For those with encryption requirements, Turbo Router can be optionally upgraded with Turbo IPSEC. To clarify how the replacement program would work, I asked 6WIND a few questions and received this quick response. 1. Does 6WIND have a partnership with Brocade on this replacement program? 2. Is there feature parity between Turbo router and vRouter? If not, what are the major differences potential customers should be aware of? 3. Is the hardware requirement roughly equal between the two, i.e. is this a one-for-one replacement? Or do I have to think about my hardware before jumping to Turbo Router? 4. What, exactly, are the pricing or other incentives 6WIND is offering? 5. Will 6WIND offer migration assistance? Could be a lot of work for an end user to translate configuration stanzas and operational processes over to a new platform. The official press release from 6WIND on the vRouter replacement program can be found here.